Like many things in life, welding work goes better if you make the right preparations. There are clear steps you can take as a welder to ensure an easier path to high quality production. 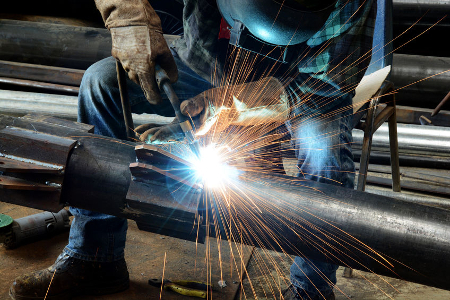 Besides beginning with quality welding equipment from Sidney Lee Welding Supply, you’ve got to have the right safety supplies such as helmets, gloves, and appropriate ventilation. Then as far as actual welding techniques go, we’ll go over some of these steps next. If you are working on a pipefitting application, proper prep can prevent getting inclusions into the metal that will weaken the pipe weld fusion. Maybe the key detail is in the precise measurement of pipe joints. So therefore a major responsibility lies in the hands of whomever it is who cuts the pipes before they are welded together. If you’ve received the oxy or plasma-cut pieces, be sure to get a perfect bevelled edge with a grinder or your preferred method of machining the details with your favorite welding equipment. Next, once its an accurate fit, cleaning the metal is crucial. Machine cutting can leave lubricant residues which much be removed before welding. Likewise, oxy or plasma cutters can result in oxidation layers that have to be cleaned. Failure to remove these extraneous layers can result in inclusions that will weaken the overall pipe weld. Cleaning the metal nearest to the welded joint is especially important to reduce porosity. Fitting the pipes accurately involves being certain that the inner diameters are exactly equal. If you measure slight discrepancy between two adjoining pieces, you can use a grinder to establish parity before welding. This can be a key step in the pipe-fitter’s inspection process. A pre-weld inspection can save trouble down the line. Checking the cleanliness of the workpieces to be joined, as mentioned above, is a good place to begin. Knowing the right kind of welding gas, if any, to use with your arc welding machine for the specific metal you are working with, is an obvious parameter to be sure of before you weld. A major area of pre-weld concern is the precise measurement of root openings, since this will determine the depth of weld penetration into the workpiece. Bevel angles and exact alignment of joints need to be similarly accurate to the 1/16th of an inch or less to ensure quality and longevity of welds. If you are able to carry out these kinds of pre-weld inspections, great! If not, just ask your local experts at Sidney Lee Welding Supply to learn how to become the welder you want to be! They are awaiting your queries at any one of five locations in the Atlanta, GA area.